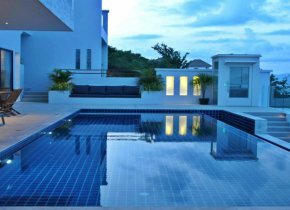 Reduced from over 60M to just 49M THB, the owner of this stunning sea front villa is reluctant to sell, however is motivated to sell for personal / retirement reasons. 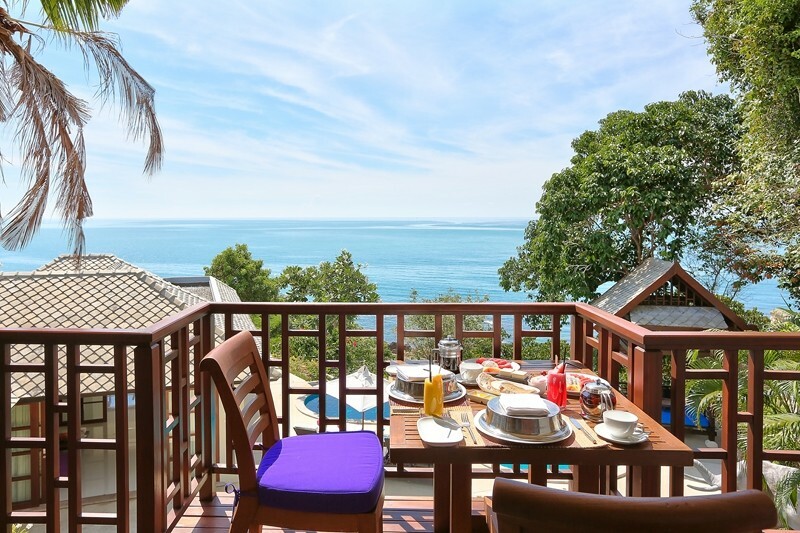 Perched on a dramatic cliff side, between two of the Koh Samui's most popular beaches, Chaweng and Choeng Mon, offers guests a superlative, VERY PRIVATE oceanfront experience. 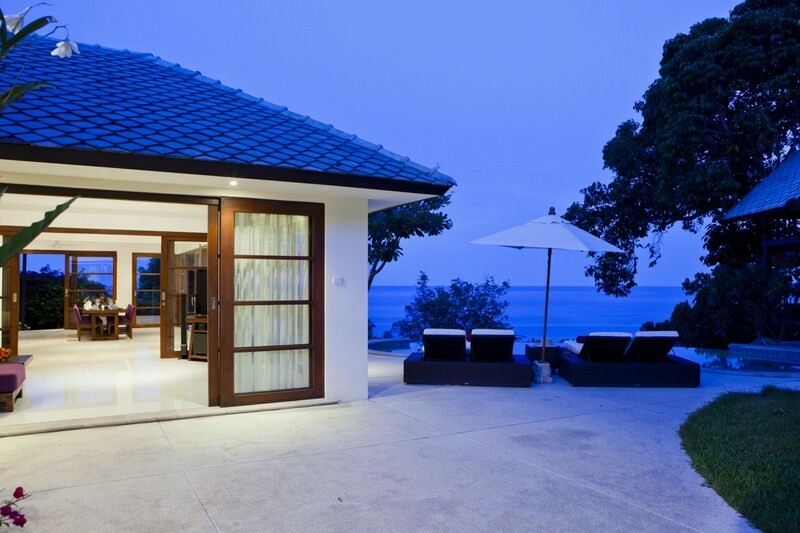 A clever combination of contemporary comforts and natural touches creates a unique and appealing tropical residence that can be easily adapted to suit a range of personal tastes and holiday needs. 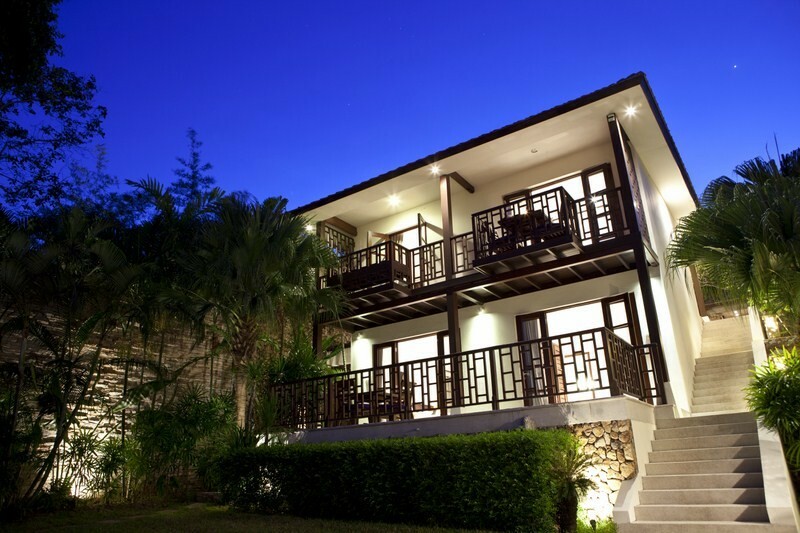 It is situated within a 5 Star resort, with the advantage of front staffed security entrance & internal resort full security: however guests/owners can choose to run the Villa as a stand alone private residence with unencumbered access, or be part of the Resort’s maintenance & rental programs. An electronic door closes off the world as you park the car and a side door leads directly to a utility room, small kitchen and maid's quarters, with bathroom shower & toilet, ideal for a nanny or helper. Outside there is a small service area with two large water tanks as emergency supply. 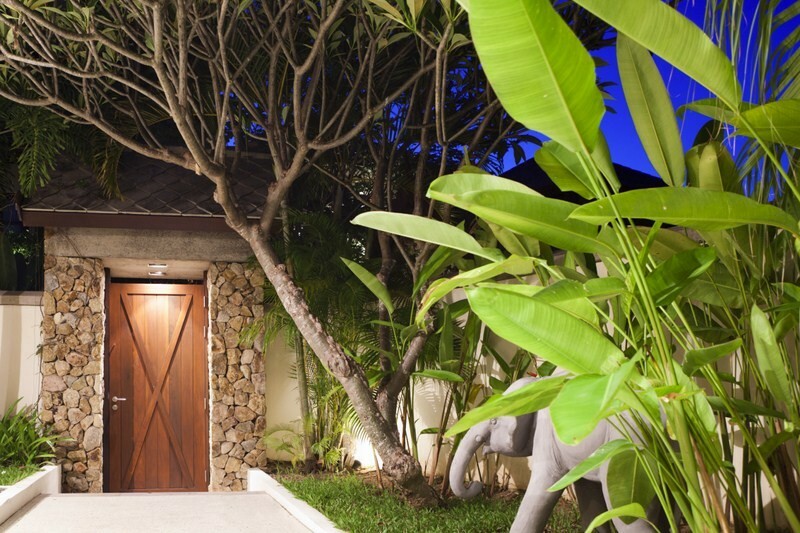 The exit on the other side of the garage opens onto an inner courtyard surrounded by tropical plants with outdoor sand washed steps leading down the side of the two storey bedroom pavilion to the pool deck and living area. Directly next to the garage, the pathway leads to the upper floor master suite, a spacious, open room that slides onto a wide wooden balcony with dramatic views out to the ocean beyond. 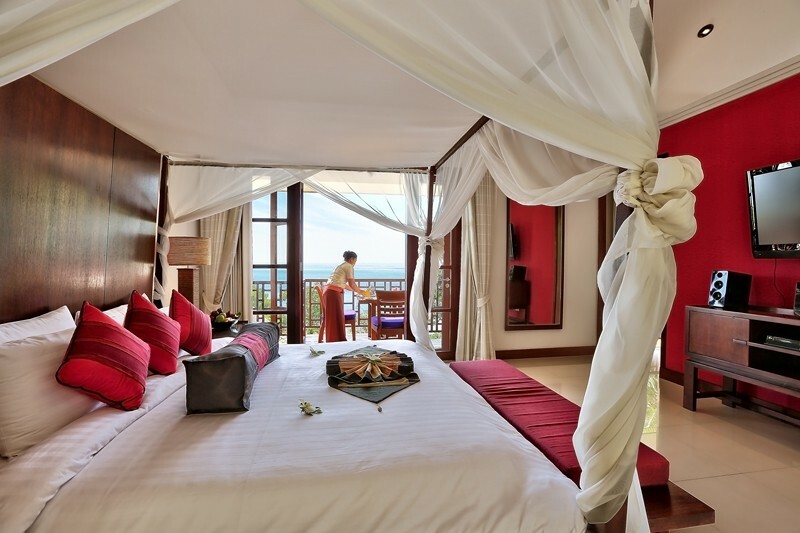 Inside, a contemporary four-poster bed faces a wall mounted flat screen TV with DVD player and speakers. There's a walk-in dressing room off the bedroom space, as well as walk through access to an indulgent master bathroom with a two-person ocean view tub, plus individual rain shower and toilet cubicles. Taking the outdoor stairs down to the next level, two well appointed guest bedrooms sit side by side: one double, one twin, each sliding open onto a shared balcony that looks out over the pool terrace and down to the dreamy blue waters of the Thai Gulf. 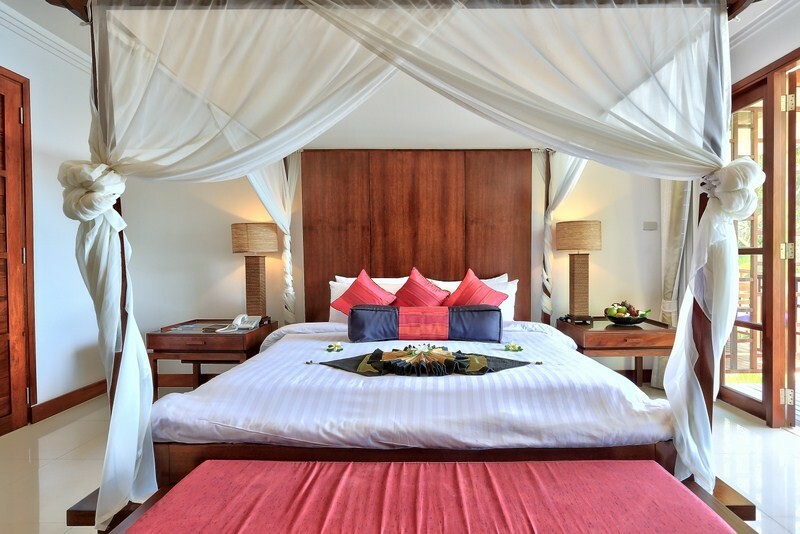 Each bedroom boasts its own modern ensuite bathroom with rain shower and there's an additional outdoor 'rainforest shower', shielded by tropical vines and accessed from the balcony. It's just a few more steps down from the guest bedrooms to the pool terrace, a wide sand washed & totally private area with a lawn and comfortable cushioned sun beds poised in front of the villa's cliff-edged infinity pool. 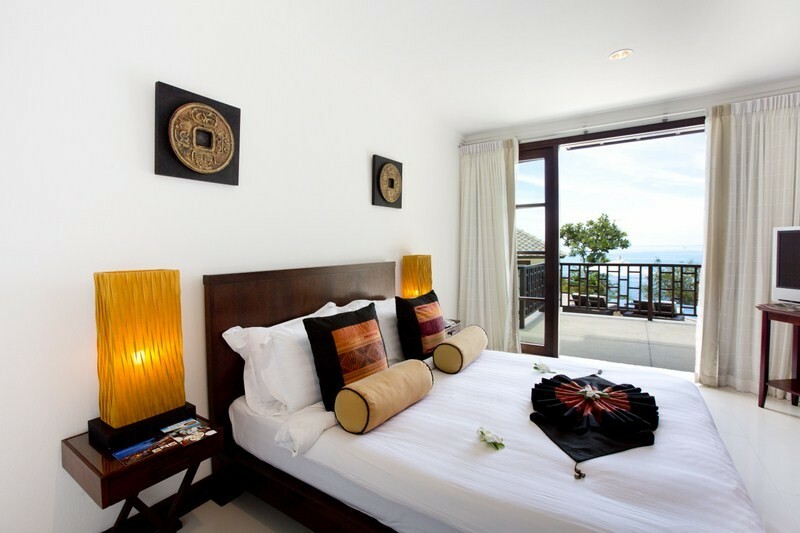 Spectacular 180-degree views out to Samui's offshore islands make this a pleasant, private sun lovers' paradise. 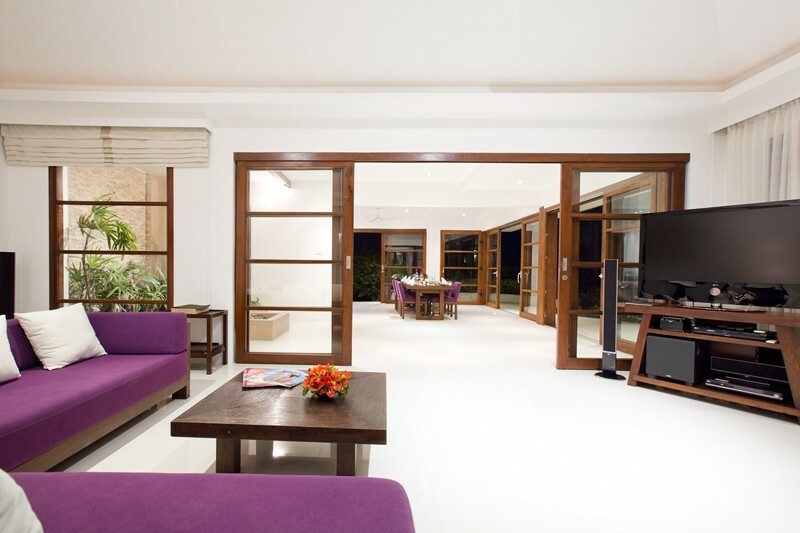 To the left of the terrace, a fourth bedroom is attached to the villa's pool level lounge, dining room and kitchen. 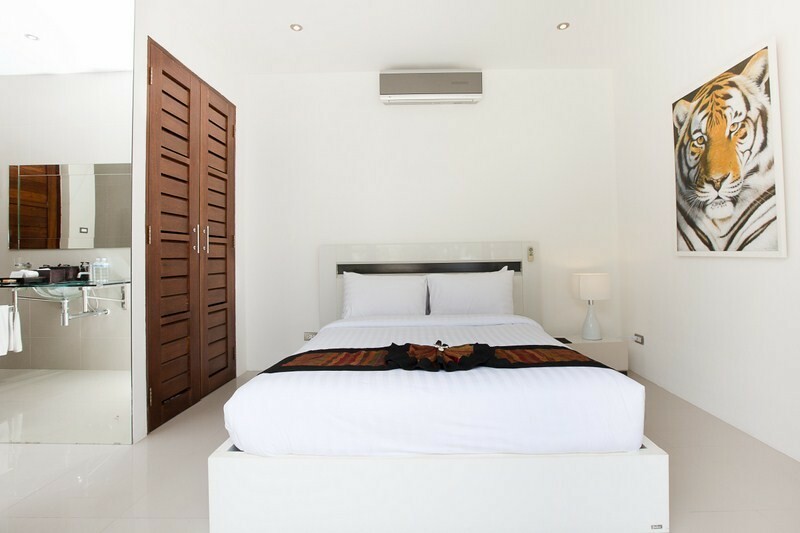 This comfortable double guest room has its own ensuite bathroom and private entrance with glass doors opening directly onto the warm tropical surroundings. The bright ocean view lounge and adjoining dining room sit in a spacious open plan pavilion with sliding glass doors that open up the entire space. 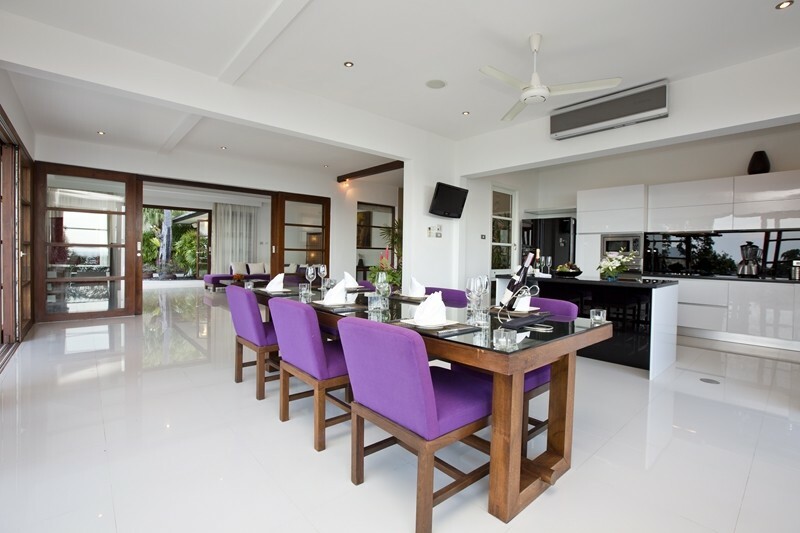 A deep, purple L-shaped sofa faces a 44" flat screen TV and DVD player with surround sound, while in the next room a 6-seater dining table is served by a modern kitchen equipped with brand name appliances including a SMEG oven and hob. The minimalist design suits the setting with Asian art and an intriguing inner garden with leopard statue adding a sense of exotic charm. 1. Join the Resort rental pool & maintenance program, and the 5 star resort manages the villa for you on a day-to-day basis.